Specialized in real estate, commercial leases, construction law and contract law, Guillaume Jeannet acts in both transactional and litigation matters. He regularly assists and advises leading investors highly active in France, both in connection with investment and acquisition projects, and in the management of their assets. 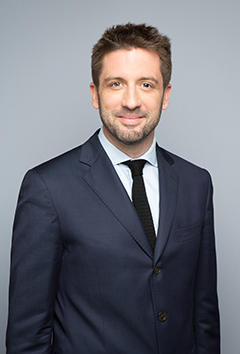 Guillaume Jeannet started his career at Gide in 2004, where he initially spent 6 years at the Beijing office before joining the real estate practice where he was appointed counsel. He joined Lacourte Raquin Tatar in 2017 as a partner in the Real Estate Transactions practice. A lawyer since 2004, he earned his post-graduate degree (DESS-DJCE) in business law and taxation from the Université de Nancy II. From 2014-2016, he taught advanced contract law in the dual French/Foreign law Master program at the Université de Paris I Panthéon-Sorbonne. Counsel to Ivanhoé Cambridge on the acquisition of Cap Ampère, an office campus of nearly 90,000 sq.m spread over several buildings in the Saint-Denis Pleyel district and sold by AEW on behalf of an institutional investor. Counsel to LaSalle Investment Management and JP Morgan Asset Management on the rent of a total surface area of ​​14,232 m2 (including a share of the service areas) in the Magnetik building (ex-Périsud) to Chronopost for a period of 10 years. The building, constructed in 2005, is located in the 14th arrondissement of Paris and had been subject to an « ambitious » renovation program in 2016. Counsel to J.P. Morgan Asset Management on the disposal of an approximatively 22,000-sq m2 office building named Metropolitan located in Paris (17th). Counsel to LaSalle Investment Management on the acquisition of an approx. 8,000-sq.m. office building located on Rue Bayard in Paris (8th), currently occupied by RTL. The building will be subject to refurbishment works following RTL’s vacation. Counsel to JP Morgan Asset Management on the sale of “Les Docks de Marseille” real-estate complex in Marseille consisting of five buildings developing a shopping center on the ground floor and six office floors for a total area of about 60,000 sq. m. The shopping center, called “Les Docks Village” was voted best shopping center at the 2016 MIPIM Awards and was awarded the ULI Global Award for Excellence 2016.